Dolores Burton is an author and educator. As a Fulbright Senior Scholar, she has worked nationally and internationally to improve teaching and learning for students of all ages. Her writing reflects her passion for helping all students succeed. Her two co-authored books on effective instructional strategies for teachers and parents: The Complete Guide to RtI: An Implementation Toolkit and Mathematics, the Common Core, and RtI: An Integrated Approach to Teaching in Today's Classrooms, were published by Corwin Publications. Her first children’s book, But You Don’t Look Like Me! is about Burrowing Owls on Marco Island, who learn a lesson about friendship and acts of kindness. Her second children’s book, Bully Billy is Back! The Burrowing Owls are Worried, tells the story of an owl learning it is better to be a friend than a bully. She recently completed a middle-grade manuscript, A Story of Courage: Supreme Court Justice Sonia Sotomayor. All books are available on Amazon.com. Dr. Burton is a former teacher, school district administrator, professor, and chair of teacher education. Everyone has a dream. Some people dream of being a good parent while others would like to become a Supreme Court Justice like Sonia Sotomayor. This Latina from Bronx, New York not only fulfilled her dream of becoming a Justice, she exceeded it by becoming a Supreme Court Justice. 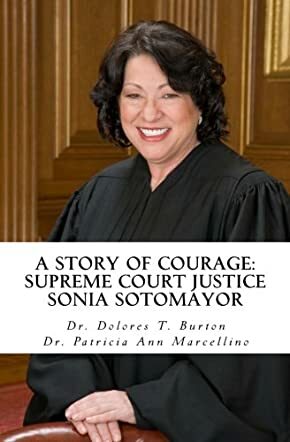 In A Story of Courage: Supreme Court Justice Sonia Sotomayor, authors Dr. Dolores T. Burton and Dr. Patricia Ann Marcellino give young readers the steps that it takes to realize their dreams. In this book, children will be shown what perseverance, hard work and overcoming challenges look like to fulfill a passion that burns inside of you. Justice Sotomayor became a lawyer and then a judge by staying focused, keeping good grades and working hard. To stay consistent with her goals, Justice Sotomayor’s idols in her youth were Nancy Drew and Perry Mason, which is what inspired her continually. In this book, Drs. Burton and Marcellino reflect that, as with Justice Sotomayor becoming a Supreme Court Justice, dreams can come true. I love, love, love this book because children, especially in the minority communities, need more role models like themselves that are in high and influential positions, making a difference. Justice Sotomayor did her part, but had help along the way from others who saw her integrity, passion and sacrifices in helping and working with others. In this book, Drs. Burton and Marcellino not only give some enlightening insight into Justice Sotomayor’s journey, but they have created a great educational resource for young readers to learn about the judicial system. Additionally, to heighten the educational experience, Drs. Burton and Marcellino have added Words to Know, Legal Term Glossary, Videos About Justice Sotomayor, References and Teacher Resources. With love, drive and courage, keep on dreaming!